Bonus #2: Characters Introduces In the 1986 Animated Film, Who Have "Classics"
This project will be an attempt to recreate the original American Generation One toy catalog using modern toys, beginning with the 2006 "Classics" line. When possible, official Hasbro or Takara Transformers will be used. This project will be using this page from the Transformers Wiki as reference, and will as much as possible be formatted to match it. For each toy, a minimum of two photos will be presented: one photo for each mode. Minor mode variations (such as Jetfire sans armor) will not be presented. As much as possible, photos will be from my own collection. If outside photos are used, they will be credited appropriately. Official toys will be identified by toyline and year of release. If it is a character with a third-party upgrade, this will be noted if the upgrade makes a significant enough improvement (in my opinion) so as to not adequately represent the original toy without it. (Many figures may have on them Reprolabels which help them better match a "G1" aesthetic. This will not be noted here.) Repurposed or third party figures will be identified by the toy's original designation. For characters who (in my opinion) currently have no definitive "Classics" representation, I will try to present one or two recommendations that are popular with other Transformers fans, with notation to their "non-definitive" status on this list. 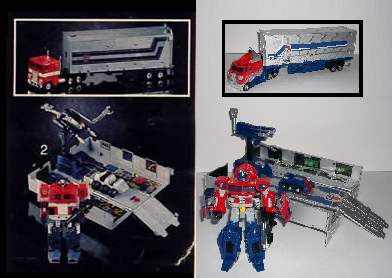 If there is no updated option, this shall also be noted under a placeholder photo of the original G1 toy. -Level 1: Official Hasbro retail releases intended as a modern G1 update. (Some may have third party upgrades, but these upgrades will be useless without the core figure.) This includes retailer exclusives, as they are usually still easily available to most collectors at the time of their release. -Level 2: Takara retail releases with no Level 1 equivalent. (Some may have third party upgrades, but these upgrades will be useless without the core figure.) "Level 1 equivalent" typically means a toy of the same character using the same mold, with the main difference being in the figure's color scheme. If the same character is present in both Level 1 and Level 2, but using two different molds, priority will be given to whichever mold the author of these articles feels best aesthetically represents a modern update of the G1 character. If in whichever level is being used for a particular character there are multiple representations of the same character, priority will be given to whichever toy the author of these articles feels best aesthetically represents a modern update of the G1 character. There may be occasional exceptions to the above, which if occurring will be noted with the toy in question. Photographs in this project come from a number of sources. Ideally, the majority of the photos will be taken by the author of these articles using toys from his personal collection, or by other people owning toys the author of these articles may not have who wish to contribute their own photographs. Where gaps may still exist when the various articles go live, photos may be taken from sources such as the Transformers Wiki, TFU.info, or various online retailers. If any readers notice photos credited from such sources, and have the ability to contribute personal photographs to replace them, submissions can be submitted by e-mailing them to Yotsuyasan@aol.com. Please try to make your photos match the style of other photos taken for this project. Please include "CTC Photo Submission" in the e-mail's subject line, and please say under what name you would like to be credited. Please note that this is project a work in progress and not yet complete! Yotsuya's Reviews is an unofficial Transformers fan site. It is not associated with nor endorsed by Hasbro or Takara Tomy. Transformers® is a registered trademark of Hasbro, Inc.